Through the Internet (or sometimes also in the form of printed leaflets, etc.) we often receive an email that talks about 'evidence of Allah's greatness or miracle of Islam' or 'miracles of Allah' or simply contains a link to a site / blog which includes news or explanation of what is considered or claimed to be 'a clear proof of Allah's verses or its existence'. Usually, the news are in the form of a surprising: the form of images or natural events that are 'strange' or unusual. For example, the appearance of the written words for Allah or its last messenger, Muhammad or sentences related to Islam on the things from nature. But some go further than that, like the ones below. Have we ever enquiry or question the authenticity of such images? May be it is just a painting, a creative work of its artist (like the trees that form the tahlil sentence: laa ilaaha illallaah)? May be it is even a forgery or falsified pictures (like the ones discussed below)? What if there are also natural occurence of other words or symbols related to other religions or beliefs, such as the face of Jesus or a cross? They can also claim that such things are the miracle of their gods, the evidence of the greatness and truth of their religions. 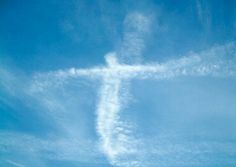 Clouds form a crucifiction - Jesus on Cross??? Honestly, do we need to proof the truth of Islam or the greatness of Allah this way? This writing does not aim to put aside the greatness of Allah or debunk the truth of Islam, but to show that those acclaimed miracle pictures often miss the point or do not even serve as evidence. This passage calls for Muslims to be more critical and do not just re-distribute such 'miraculous pictures' without reviewing them first. The greatness of Allah, the miracle of Islam or the truth about the words of God are self-evident in the content of the Qur'an. When we ponder the many verses of the Qur'an, learn them and act according to its teachings and message, we will surely find that Islam is the true religion and Allah is the Great! To begin with, just look at the image at right. It is a widely spread picture in the internet, especially within muslim community. Some call this floating rock, some flying rock or stone. Some even call this a miracle of Allah, of the Prophet or Islam. What make the picture an 'attention grabber' are also the stories that accompanied the emails or blogs about it. Another story adds the above description and said that it is is now under the Dome of the Rock, in the Palestine. Some said the rock is now tightly guarded by the israely soldier as not to attrack muslim and to cover the miracle of the Prohet of Allah. Some said it is a rock in eastern part of Saudi Arabia, in a village called Al Hassa. The rock is said to float about 10 cm from the ground at a specific time every year and then sit back on the ground. Many muslims believe the stories and account the picture to be true and eagerly said: 'Allahu Akbar! (Allah is the great!)' or 'this is the miracle of Allah'. Many others questioned it. Still among the non-muslims, the picture raised some doubt and questions: is the picture real? 3. It can be shown that the picture has been somehow manipulated or doctored. Several people pointed to the part below the rock, under the shadow. See below. After sometime of believing that the picture is not true without able to prove it, I finally come accross an arabic forum where the members discussing this. Thanks to image search engines, I can show you the pictures below that show the original rock in several viewing angles. The pictures show why the 'floating rock' is almost so convincing that many people reject to accept that such is only a manipulated image. The rock itself is unique, and is supported by at least three rock structures below it. The supporting rocks seem to be a continuous part of the rock that unite it with the ground. The supporting rocks are relatively very small compared to the size of the rock above them. From the forum, I also learned that the rock is actually located in Al Qarah, Al Ahsa, near Tuwaithir village in the eastern part of Saudi Arabia. You can see what the place looks like and the many unique rocky structures it has here. There is also another reference to the original rock in flickr. 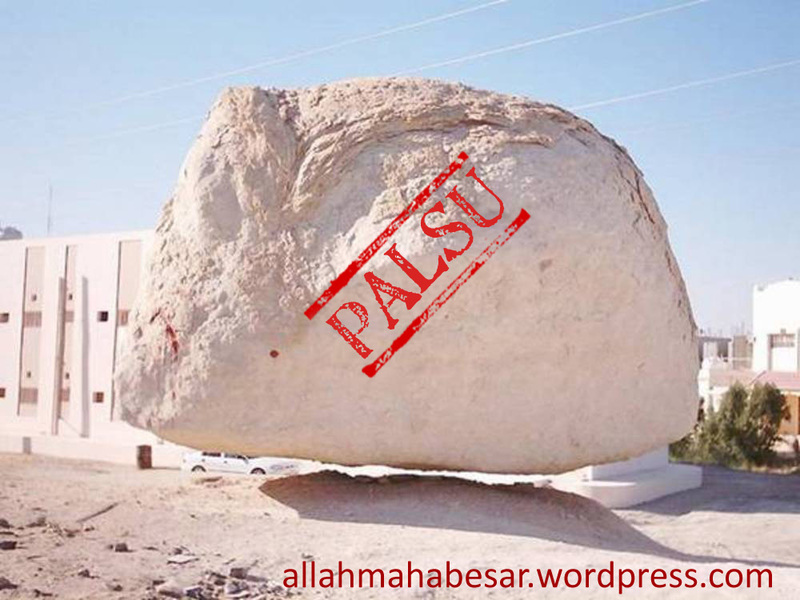 This is the picture of the rock that is believed to be the standing point when the Prophet Muhammad about to ascend to heaven in the event of Israk Mikraj. It is located in the infamous Dome of the Rock, in Jerusalem, one of the famous landmark of the Palestine. Is this rock actually floating? Honestly, i do not know the answer. But this is a very famous place and many pilgrims visited it every day, they should have known it if it is floating in the air. I hope this is enough to prove that the so-called 'floating rock' - and the miracle story that accompany it - is not true. For fellow muslims, I just want to say that we should not hurryly believe pictures or stories that is attributed to be the miracle of Allah, or Islam. We can still be a believing muslim, even if we do not believe such 'miracle pictures'. That rock is nothing compared to the Power of Allah.